After the successful release of their third album, Everlasting Fire, in 2014, Sit Kitty Sit was devastated with a non-stop series of personal tragedies. For the next three years, serious health issues, suicidal depression, separations, and homelessness nearly consumed the hard piano rock duo – but somehow they clawed their way through. Sit Kitty Sit’s long-awaited fourth album, Tectonic, is the summation of their own experiences with rage, destruction, and defiant survival in the face of crushing personal circumstances. A struggle that left them forever changed and magically stronger than ever. The first single from Tectonic, “Paper Doll”, captures the manic energy of suicidal depression while wearing a mask to hide it in public. For the heartbreaking “Burst”, Downs captured the contradicting messages in her head during the darkest part of her depression by starting with a single piece of piano music, then composing two completely different songs over it – one voice telling her to give up and the other telling her to fight. In his songwriting debut, Thompson embodies the sensation of hitting rock-bottom in “Skinned”. Finally, the duo rediscovers hope and moves onward with the co-written track, “Tectonic Shift”. 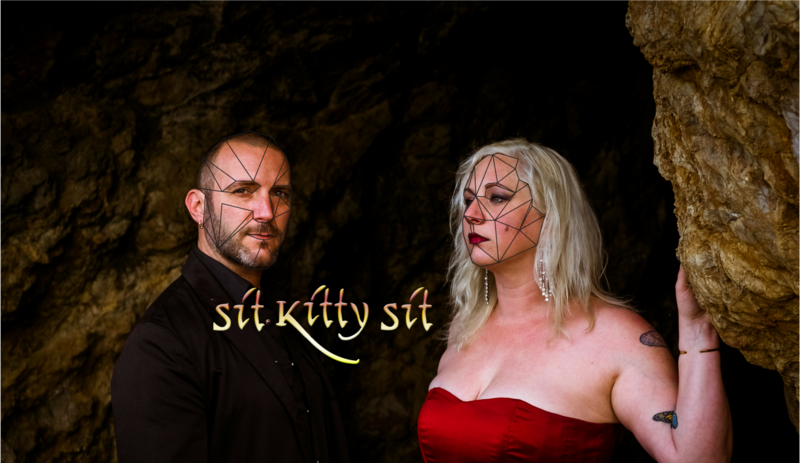 Sit Kitty Sit is a Hard Piano Rock duo based in San Francisco, California. Since 2010, Kat Downs (piano/vocals) and Mike Thompson (drums) have let loose an expertly manipulated balance of blow-your-mind power rock and virtuosic intricacy that leaves audiences screaming. Typically described as “The Dresden Dolls mixed with PJ Harvey and a dash of Muse”, Sit Kitty Sit has toured all over the US and Europe and shared the stage with such names as Listener Family Band, Birdeatsbaby, and LP. Their fourth studio album, Tectonic, releases May 4th, 2018. No holds barred, Sit Kitty Sit produces addictive rock n’ roll – with only two people and not one guitar in sight.